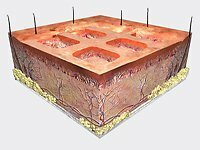 Mr Andi uses Integra dermal regeneration templates in selected cases which may benefit from artificial skin. 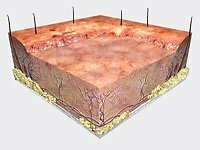 When the INTEGRA® Template is placed on a wound where diseased or scarred skin has been removed, INTEGRA provides the needed framework for the blood vessels and dermal skin cells to re-grow into a new skin layer. The silicone outer layer temporarily closes the wound to ward off infection and control fluid and heat loss. 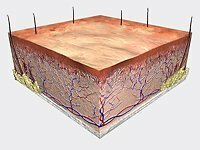 As skin cells migrate into the matrix the collagen is slowly absorbed into the body and replaced with protein that is naturally produced by the skin. 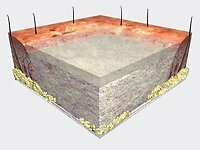 In approximately 14 to 21 days, new dermal skin is produced and the silicone layer can be removed. 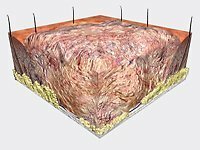 A thin skin graft of the person’s epidermis may be applied to the wound area to complete the procedure. 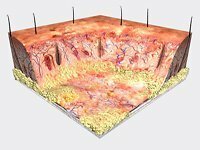 In total, the two surgical procedures are typically completed within 30 days and you will be left with flexible growing skin and minimal damage at the skin graft donor sites. 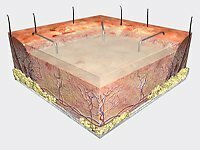 INTEGRA® Template is applied to the excised wound bed. Fluids invade the matrix within minutes of application, adhering it to the wound. Upon formation of a new dermal layer, the INTEGRA silicone layer is removed. The INTEGRA collagen template biodegrades and is absorbed into the body, leaving new dermal skin.